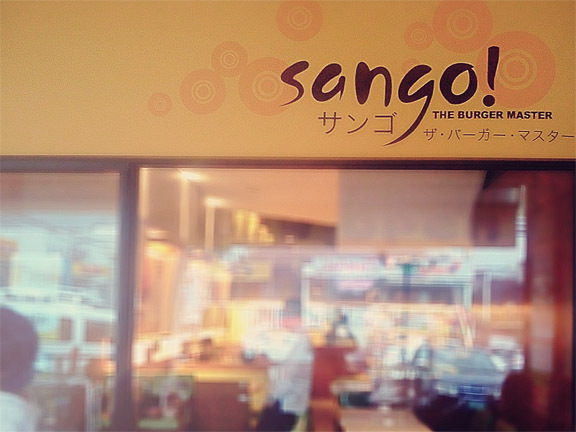 Sango is one of the newest restaurants in Tomas Morato. The time we ate here, it was still in its soft opening. I didn't know about this place nor heard of it before, we just passed by it and saw the words "Burger Master". Being a burger enthusiast/hunter myself, I couldn't let it pass. 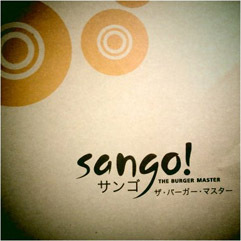 Sango's interior is a fusion of modern diner and Japanese style. 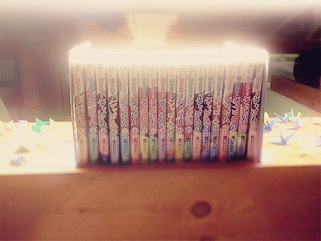 It has a number of modern japanese decos like origami and mangga books available for reading. The lights at the mezzanine are a bit dimmed to add to the ambiance. It really is a good place to relax or for dates. 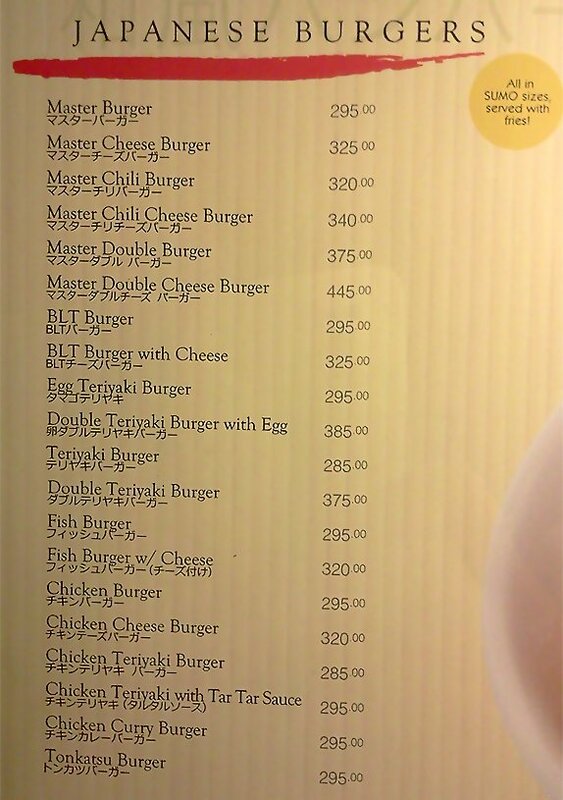 I ordered the Master Double Burger. Its the only burger so far that I couldn't bite into. 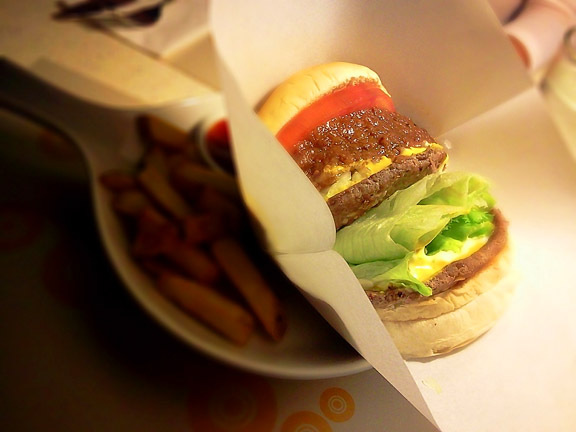 The burger is a thick, approximately 3.5 inches thick, sandwich filled with lettuce, tomatoes, onions, two patties of beef and a special sauce, which is a mixture of chili sauce and curry. I wasn't really able to sense the taste of the patty, but the sauce is really good. Although, I still do prefer the taste of a good old meat patty hamburger! My son ordered the Rice Chicken Burger, which isn't on the menu, but is just a fried chicken patty with sticky rice buns and lettuce. My son just ate it like a regular chicken and rice meal. 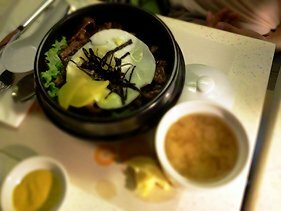 And then my wife ordered the Yakiniku Don. Its a rice topping with beef and eggs cooked over easy. 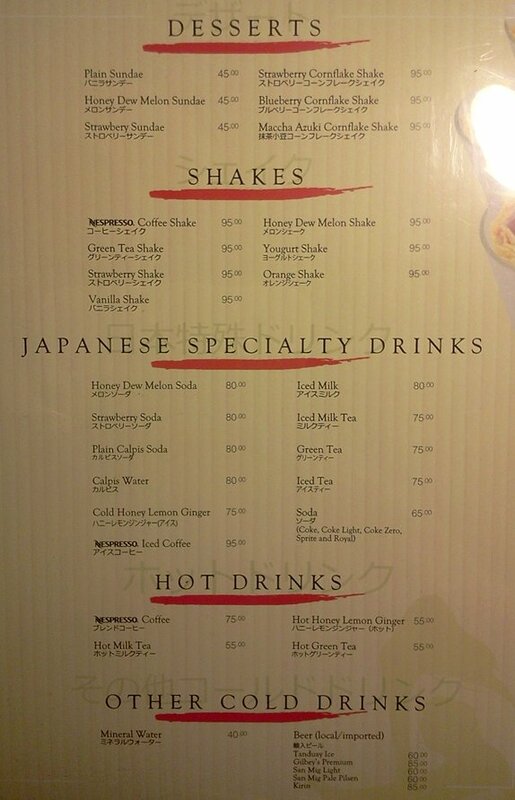 They also have a number of desserts, ice creams and shakes. 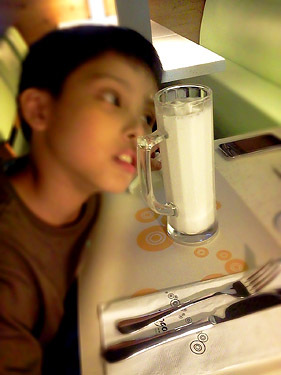 My son ordered the Vanilla Milk Shake and my daughter ordered plain sundae, which are basically the same and tastes like Shakey's shakes. 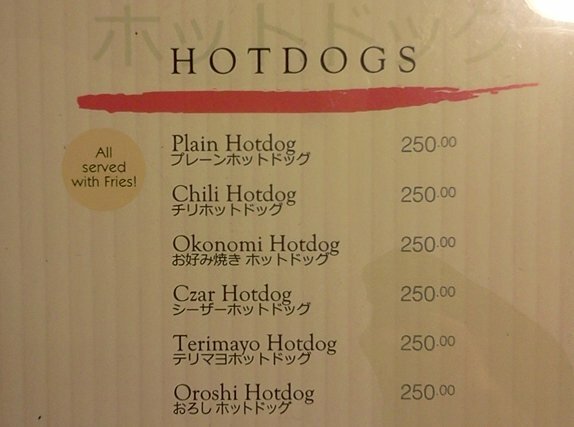 The prices of the food are a bit on the expensive side, but definitely worth it. Still a little cheaper than Johnny Rockets. 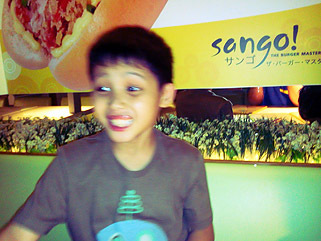 The burger I ordered is about P375. 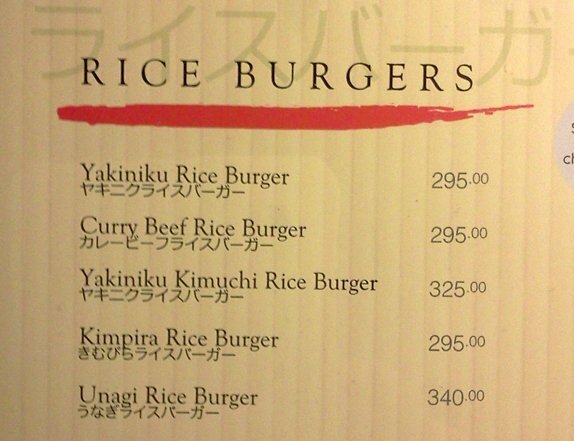 The same burger with cheese is P450, which is the top of the line. Overall it was a good experience. The place and the food are very good. 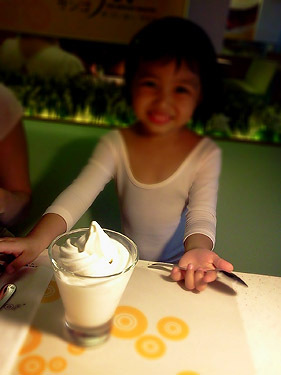 The waitress that took our orders was very pleasant, smiled a lot and was very quick to serve. There should be more service personnel like her. 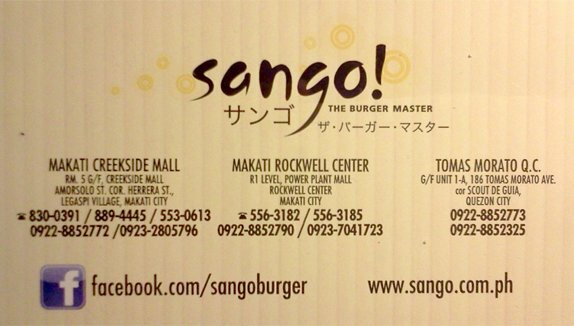 I highly recommend this place for casual dates, barkada reunions or if you're looking for a different approach to burgers. 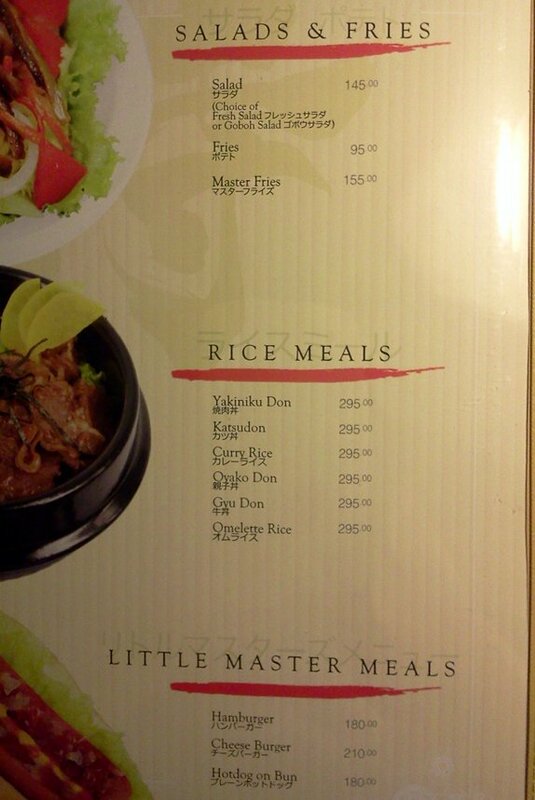 Now here are some screenshots of their menu. 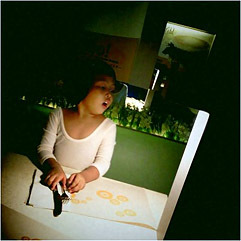 All images were taken with a Samsung Galaxy Tab P1000 using Camera360 app and Vignette+ app. Marcel Correct. 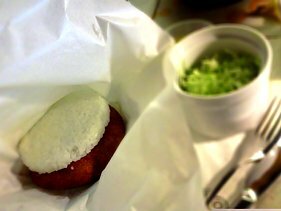 I didn't taste the rice buns eh, just the chicken and rice meal. Hehe. Guia We have this near the office! u8mypinkcookies love their burger too. i also like the fries sprinkled with chili powder. Nomnom!